A Laser Doppler Velocimeter (LDV), also known as a Laser Doppler Anemometer (LDA), is a type of interferometer that measures the velocity of objects using laser light. The objects can be microscopic particles in a fluid or solid surfaces—the concept is even used in some high-end laser mice. A laser beam is split and the two “arms” are made to cross outside the sensor. This crossing region is called the probe volume. Because the two arms came from the same beam, when they cross, an interference pattern is generated, and light and dark stripes form inside the probe volume. These stripes are called “fringes”. The two beams must be focused at the probe volume to 1) create the smallest possible intersection zone (increasing the “brightness” of the light reflected by the particles), and 2) to ensure that the spacing between the fringes does not change much inside the probe volume. This critical alignment is easily maintained by the design of the miniLDV because both arms of the interferometer go through the same individual optics. There is always some “fringe divergence” as it is physically impossible to build a system in which the fringe spacing is absolutely constant within the probe volume. This is because the wavefront radius of the laser (according to beam propagation theory) is only zero at the waist, which is the exact focal point of the beam. All of MSE’s LDV products are built to achieve the minimum possible fringe divergence. Fundamentally an LDV or LDA uses the same Doppler effect that causes the siren from an ambulance driving by to change pitch—except that here the Doppler effect is with light, not sound. However, there are two ways to interpret how an LDV or LDA is able to measure the speed of an object. The more intuitive explanation (see figure) goes as follows. The fringes formed by the interference of the beams is a pattern of light in space. When a particle passes through the probe volume, it goes through the light and dark regions, so if its reflected light is measured as it travels along, the intensity versus time curve looks like a sinusoid with a Gaussian envelope. The Gaussian envelope comes from the fact that the intensity of the beams is Gaussian in nature. The sinusoid is the physical travel of the particle through the fringes. The physical distance between the fringes is known from the calibration which is performed with every probe. So the frequency of the intensity signal is directly proportional to the velocity of the particle: velocity = fringe spacing x intensity frequency. Although perhaps less intuitive, the measurement still works if the object passing through the probe volume is a continuous surface. This is because the probe volumes are so small that any microscopic features in the surface will reflect different amount of light and behave almost as if the surface were a stream of individual particles. To measure the velocity of fluids like air or water, there must be something in the fluid to reflect light back. In air the particles can be as small as the smoke particles of an incense stick; for water, sometimes there’s enough signal straight out of the tap. The second explanation reveals how the “Doppler” in LDV/LDA comes about. When a particle travels through the probe volume, it will have some velocity V. If the vectors corresponding to the directions of the two beams are decomposed into a coordinate system where V is the X axis, then there will always be one beam whose “V-vector” is positive when the other one’s is negative. Really this is a mathematical way of saying that the particle is always traveling “toward” one beam and “away” from the other. Much like the red and blue shift of galaxies moving away from or toward us, the particle will add a Doppler shift to the light it reflects from each beam: the frequency of the reflected light is higher for the beam toward which it’s traveling and lower for the other. This is exactly like the pitch of a siren being higher when the ambulance is coming toward you than when it’s going away from you. The frequency of light is extremely high. For a 658 nm (red) laser, it is 45.5 petahertz (45.5 quadrillion cycles per second), so to the detector it looks like a continuous beam. However the particle now is reflecting light at 45.5 petahertz plus a little bit and 45.5 petahertz minus a little bit. When these waves arrive at the detector, it records a “beat” frequency not unlike what you hear when you press two adjacent keys on a piano. The beat frequency is significantly lower than the frequency of one beam by itself. Not only is this frequency easy to observe, but it is directly related to the wavelength of the light and the speed of the particle. For this beat frequency to be observable, the two light waves (one from each beam) being reflected from the particle must have been created nearly at the same time as each other. That is why a single laser beam is split into two arms. If two independent lasers are used, the beams are completely unrelated and no beat frequency is observable. Another way to put it is that two independent sources of light will not interfere with each other. 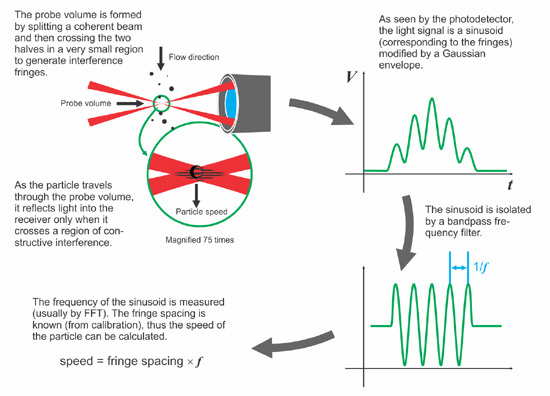 Lasers have a given “coherence length” or “coherence time”, indicating how much one wave from the laser will interfere with another wave. If they are generated exactly at the same time, the interference is “perfect”; if they are generated within the coherence time, the beat frequency is still observable, though less intense, and if they are generated outside the coherence time, no beat frequency is observed. MSE’s LDV products are all designed to maintain the “optical path length” of each beam well within the coherence length to provide the highest possible signal. When two beams are crossed in space as in a classical LDV/LDA, the interference pattern is steady with space. This means that 1) it is impossible to know if the particle was traveling from left to right or right to left, and 2) it is impossible to measure very low velocities, because it will take too long for the particle to travel through a bright and dark region (alternatively, the beat frequency is too low). The trick is to add a Doppler shift to the beams themselves. When an LDV has “frequency shifting”, the beams already have a frequency difference when they are in space, so if a particle has velocity zero, the recorded signal will have the same frequency as the difference in frequency between the two beams. The effective frequency of the signal is the sum of the frequency due to the particle and the shift frequency. So when a particle is going one way, it will add to the shift frequency; going the other way it will subtract—and if it has velocity zero it does not change the shift frequency at all. Viewed another way, the fringes are moving in space, so the actual measurement is the velocity of the particle relative to the velocity of the fringes. MSE’s miniLDV can be ordered with or without frequency shifting. For ultra-stable frequency shifting applications (to measure extremely low velocities), MSE offers the ultraLDV line. It should be noted that any LDV or LDA measures only the component of velocity along the direction of the interference pattern—so the instrument must be aligned to the flow (or some known direction so that adjustments to the results can be made). MSE also offers multi-component systems: the 2D miniLDV and 3D miniLDV.